Richard H. Kirk was already a legendary figure on the electronic scene when he teamed up with DJ Parrot, then one of the main DJs at Sheffield’s club Jive Turkey, to form Sweet Exorcist, and recorded a series of minimalist techno records which were released on a fledgling label called Warp. The following album, Clonks Coming, was to be the first album released by the label. Twenty years on, to celebrate this momentous event, Warp have collected the album and EPs into a double album. Here, we catch up with Richard H. Kirk and look back at the whole Sweet Exorcist story, from how the pair got acquainted to working with Warp and becoming part of the label’s legend. 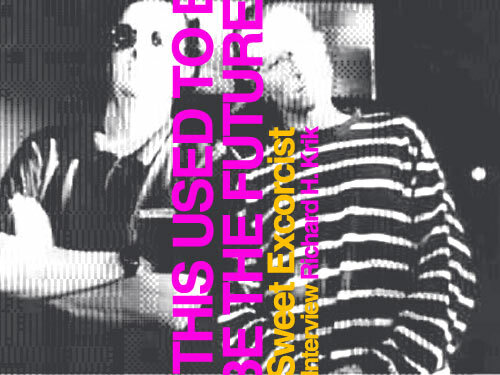 It’s been twenty years since you and Richard ‘DJ Parrot’ Barratt released music as Sweet Exorcist. The album, Clonks Coming, was the first album released on Warp, and to celebrate this, Warp have just released a double CD compilation which features the original album and EPs plus a handful of previously unreleased tracks. What do you remember of that time and of your aspirations as a musician back then? Lots of warehouse parties, really multi racial scene, the Jive Turkey club at Occasions in Sheffield where Winston Hazel and Parrot were the main DJs. Spending 200 quid a month on 12” singles from the Warp shop, even though I didn’t DJ back then. There was definitely a musical revolution happening and it was great to be a small part of it. I don’t go clubbing these days but I don’t think there were better times to be had since that period. It was before the superclub/superstar DJ thing took over. How do you think the album and EPs accompanying it have stood the test of time? I think they’ve stood the test very well. When you recorded Clonks Coming, you were already an established artist, with a very successful career as a member of Cabaret Voltaire, and you were suddenly going in a very different direction. Was it something you’d had in mind for some time? Well, it wasn’t that different. CV was electronic dance music, if you listen to some of the mixes of CV’s Easy Life from that period, it aint lightyears away. But it was a breath of fresh air to work with younger people like Parrot and Rob Gordon (Forgemasters), who I did the Xon EP with. I had been working on some proto house/techno tracks aside from CV, so I think it was more than likely that I’d end up working with some of the emergent new talent in Sheffield. How did you and Richard Barratt meet, and how did the idea of Sweet Exorcist come up? I had met Richard in Sheffield at the Limit Club. We seemed to get on OK and liked a lot of the same music, so it was inevitable that we’d talk about doing some music together. This would have been about 84/85. Then I had asked him to DJ on a Cabaret Voltaire British tour in 1986, and later CV were invited to play live on the Old Grey Whistle Test, so I suggested we play live at an early incarnation of Jive Turkey, at occasions were Parrot was deejaying alongside Winston Hazel. Some time after, I invited Parrot to come into the studio (Western Works) to help out with some proto house tracks I’d been working on. He brought along Carl Munson (DJ Ping Pong). After that they went on to form Funky Worm, so we kind of stopped. After Funky Worm had finished, Parrot came to me with this idea about making a club track with studio test tones, which were used to align multi track tape machines. We ended up using a test oscillator from the mixing desk instead, and really that’s how it started. Really, the track was conceived for dropping at Jive Turkey and Warp got involved, saying they’d like to release it. So then we needed a name and Parrot suggested Sweet Exorcist (taken from the name of a Curtis Mayfield track). I thought that was cool as I was a fan of Curtis from way back. Clonks Coming was the very first album released on Warp, which was, at the time, a very new venture, with only a few releases in its catalogue, all of which were EPs? Was it important that it was a Sheffield-based label? I think it was a question of being in the right place at the right time. I had vaguely known Steve Beckett from when he was running the Fon/Warp records shop and then they had the first release with Forgemasters’ Track With No Name, which I think did really well, followed on by Nightmares On Wax’s Dextrous. So Testone was lined up as the next release but it took quite a time in the studio to get it right. But yeah, it was great that we had a label in Sheffield. It made it kind of special. The music on the EPs and album released back in 1991 was very minimal. The influence of the Detroit scene of the time was quite clear, but who or what in particular inspired you at the time? Well there was so much, mainly by black American artists. New stuff I was enjoying around that time would be things like Equation’s The Answer, The Burrell Brothers’ Vandal EPs, the Nu Groove and Strictly Rhythm labels, Marshall Jefferson’s The Truth, Tribal House’s Motherland, Dub Poets’ Black & White EP, 808 State, A Guy Called Gerald, Unique 3’s The Theme, Mr Fingers, Suburban Knights’ The Art Of Stalking, Blake Baxter, Derrick May, Juan Atkins/Model 500… I mean it was chigago//Detroit/New York, but then a lot of British, especially northern folks, started making their own take on things, which I guess is where Sweet Exorcist fits in. The sound was very much in line with much of the releases on Warp then, as the presence of Testfour on the Pioneers Of The Hypnotic Groove compilation, alongside Forgemasters, LFO, DJ Mink, Nightmates On Wax or Tricky Disco, attests. Did you have the feeling of being part of something completely new in the UK at the time? I reckon so, alongside some of the UK artists I mentioned before. Although Clonks Coming was officially the first album released on Warp, it was originally I believed scheduled as an EP, with the vinyl version bearing the letters CCEP and catalogue number WAP13, as opposed the to the CD version, which had CCCD on its cover. Why was that? I think we just had so much material we wanted to use, it kind of outgrew the EP idea. Although it was tricky fitting fifty-two minutes onto a vinyl 12”. Ideally it would have been a double, but I guess everyone was conscious of budget, I think everyone just thought of it as an album. It was certainly the first long player Warp had done and I think it was probably the first thing not specifically aimed at the dance floor. We went off on a more experimental mission. As I mentioned earlier, to celebrate the twentieth anniversary of the release of Clonks Coming, Warp have released RetroActivity, which compiles the album, EPs and some unreleased material. What has your involvement been in this project? The license period for Sweet Exorcist expired last year so we resigned. I suggested to Warp the idea of collecting the 12” singles and the album onto two CDs. Then Steve at Warp asked if there were any other mixes in the vault, so I spent about three weeks going through the archive and transferring from a lot of different formats and sent the unreleased material on to Warp. They then compiled the album which became RetroActivity. Three years after Clonks Coming, you released a second album as Sweet Exorcist, this time on Touch. Why did you choose Touch instead of Warp then? I think that by that time we’d moved on and so had Warp. I think the material was maybe better suited to a more esoteric label like Touch. I would have been happy for Warp to do it but I’m not sure they were that into the material. You released two albums under your name on Warp in 94-95, and were also featured on the second installment of the Artificial Intelligence series of compilations, but haven’t worked with the label since. Is there a particular reason for this or would you consider working with them again in the future? By the mid nineties I was getting restless with the whole ambient/’intelligent techno’ scene and wanted to make some harder dance music, which Warp weren’t really doing at that time, so I started releasing more on my own label (Intone). Also, I suspect they had gotten a bit fed up with me releasing so many other albums as well as the ones I was doing for them, but I had a creative surge and just wanted to release as much as possible. But of course I would work with them again. They know where to find me! You’ve released music under quite a lot of aliases since. Do you think your work with Sweet Exorcist has impacted at all on the music you’ve released since, and if yes, how? No, I think that was just another project I was involved in, but a pretty damn good one. It was a good experience but I moved on to other things after that. A few years ago, you released an EP on Sheffield-based imprint Dust Science. Do you think you’ll be working with them again? Maybe, we’re still in touch and I’ve deejayed with The Black Dog a couple of times and just done a remix for them. In the mid nineties, you set up your own record label, Intone, which has been an outlet to release your own music, but the label seems to have been dormant for a little while. Do you have any plans to release more music through the label? Yes, but I don’t have distribution for physical releases at the moment. I’ve been releasing most of my new work (and archive) through AWAL/iTunes, but I’m really keen to do some vinyl and CD releases sooner rather than later. Most of the releases have been digital. Do you see the CD as a dying format now? Sadly it looks that way, although I might add I’ve never downloaded any music, legally or otherwise. I’m still buying all my music on CD and there are still a lot of other people doing the same. As part of Cabaret Voltaire, you were one of the pioneering members of Sheffield’s electronic music scene. Did you have any incline that your work would become so influential in the nineties and beyond? How do you feel about it? No inclination about that, but it’s great that people are still talking about it/discovering it many years later. Your release schedule has been pretty relentless for many years. Do you still find it the same making music now as when you started or doe s it mean something very different nowadays? No, partly because so much time has passed since I started around 1973. Also, most of what I do now is computer driven, whereas before it was mainly played by hand on instruments, which is what I’ve started getting back to recently. What’s next for you? Which one of your projects are you working on? Is there any new Richard H. Kirk record due out in the coming months you can talk about? I have three different albums which I’m hoping to finish by the end of the year but I’m not saying what they are at the moment. Email interview November 2011. Thank you to Richard H. Kirk and Leah Ellis.